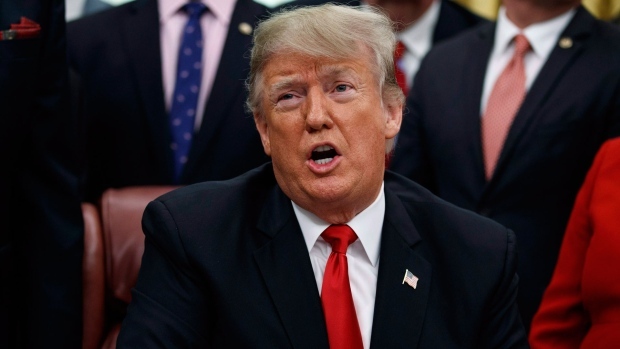 WASHINGTON -- U.S. President Donald Trump long ago backed away from his campaign pledge to construct a wall along the U.S.-Mexico border, his outgoing chief of staff said, as the president's demand for "border security" funding triggered a partial government shutdown with no end in sight. John Kelly, who will leave his post Wednesday after a tumultuous 17 months in the job, said in an exit interview with the Los Angeles Times that Trump abandoned the notion of "a solid concrete wall early on in the administration." It marked the starkest admission yet by the president's inner circle that his signature campaign pledge, which sparked fervent chants of "build that wall" during Trump's rallies and is now at the centre of a budgetary standoff, would not be fulfilled as advertised. "To be honest, it's not a wall," Kelly said, adding the mix of technological enhancements and "steel slat" barriers the president now wants along the border resulted from conversations with law enforcement professionals. But on Sunday White House counsellor Kellyanne Conway called discussion of the apparent contradiction "a silly semantic argument." Talks have been at a stalemate for more than a week, after Democrats said the White House offered to accept $2.5 billion for border security. Senate Democratic leader Chuck Schumer told Vice-President Mike Pence that it wasn't acceptable, nor was it guaranteed that Trump, under intense pressure from his conservative base to fulfil his signature campaign promise, would settle for that amount. After cancelling a vacation to his private Florida club, Trump spent the weekend at the White House. He has remained out of the public eye since returning early Thursday from a 29-hour trip to visit U.S. troops in Iraq, instead taking to Twitter to attack Democrats. He also moved to defend himself from criticism that he couldn't deliver on the wall while the GOP controlled both the House and Senate. "To my Democratic friends, there will never be a deal without wall funding," Graham said on CNN before the meeting with the president. After meeting with the president, Graham said Trump was "open-minded" about a broader immigration agreement, saying the impasse presented an opportunity to address issues beyond the border wall. But a previous attempt to reach a compromise that addressed the status of Dreamers broke down last year as a result of escalating White House demands.